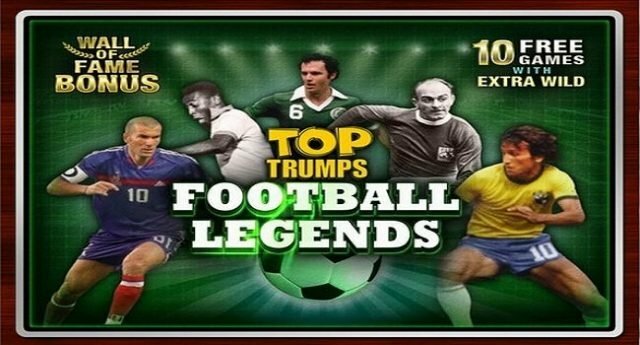 Top Trumps Football Stars: Sporting Legends is 5 reels and 20 paylines online video slot game powered by Playtech software. Coin size for this slot starts from 20p per spin to £20 per spin. There are 3 bonus rounds available in this slot game which can give you free spins as well as 1x multiplier. This slot is all about footballers where you would join greatest footballers. You will win top cash prizes from random wilds with respins. This is a progressive jackpot game which hosts daily, weekly and monthly jackpots for their players. In this slot game you can choose which top footballers can be 5 highest paying symbols. The game is set against a football ground where you will hear noise of cheering fans while making every spin. Almost all the top footballers of the world playing real football for their country are available in this game. The game features Players like Neymar jr, Lionel Messi, Cristiano Ronaldo, Gareth Bale, Arturo Vidal, Wayne Rooney, Alexis Sanchez and Sergio Ramos. You will receive 25 times of your total stake when you hit the highest paying symbol. Other symbols of this slot game are A, K, Q, J and 10 playing cards. The game includes wild as well as scatter symbols. The football itself is the wild symbol in this game which can replace all other symbols except the Top Trumps scatter symbols and the trophy bonus. If you land 5 of these wild symbols across a payline you will get 25 times of your total stake. There is a Free Kick Respin feature available in this game which can be triggered during base game. In this feature a football will bounce and a random player symbol will transform in to a wild symbol and it will make you win big cash prizes. The football will jump towards the goal and if it gets through to the goals net, then you will get a free respin. Many more free respins can be triggered during this particular bonus feature of this slot machine. The game also consist a Wild Free Games feature and a Football Trophy Bonus feature. The trophy bonus feature gets activated when you land the trophy symbol on 1 and 5 reel in the base game. This feature will give you an offer to pick 3 of total 21 Top Trumps cards, where you would cash prizes and extra picks. This is one of the best online slot game these days powered by Playtech casinos. You can play this slot using your desktop or mobile phones at any Playtech casinos for real money.